There are two important approaches to measure the accelerated expansion of the Universe, the geometrical and growth structure approaches. Baryon Acoustic Oscillation (BAO) provides the geometrical approaches as the standard ruler of the Universe. In early state, the Universe was very hot and dense. Photons and Baryons tightly coupled together with the very homogeneous density and tiny fluctuation. After the Universe expands, it becomes cooler and less dense. Its density fluctuations grows due to the gravity. 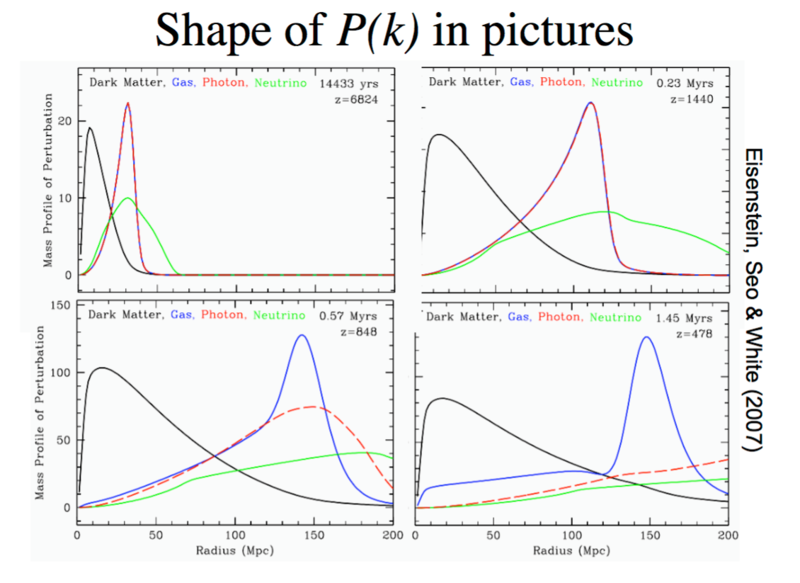 Baryon-Photon are compressed when they pass through the overdensities and rarefied while they come out. These attraction and stretching generate the sound wave and create the acoustic peak in CMB. This acoustic wave travels through the Universe until the temperature low enough to allow Baryon and Photon decoupling. By measuring BAO peak we can estimate angular diameter of cosmic structure. Show the Mass profile of matter species due to the BAO.